Firm Foods https://www.zumub.com/images/large/firm_foods/firmfoods_100pc_whey_isolate_1k000_LRG.jpg 1FIR9091 There are no reviews yet. Whey protein is a popular choice for all types of sports-oriented people and fitness enthusiasts. But how would you know if your whey protein supplement offers 100% pure whey without any fillers or unwanted ingredients? If you want 100% pure whey protein isolate to fuel your athletic and muscle-building activities, you can't go wrong with Firm Foods 100% Whey Isolate! Firm Foods Whey Isolate stays true to its name, providing you with 100% pure whey protein isolate – nothing more, nothing less! 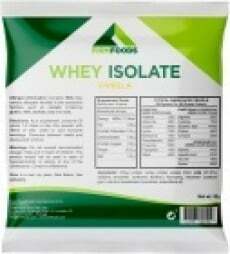 Whey protein isolate is considered to be the purest form of whey protein, as it contains virtually no fats and lactose. Whey protein isolate is a complete protein source, giving you a complete range of amino acids needed for muscle growth, recovery, and development. Whey protein isolate is also quickly digested by the body, making it an ideal protein source to be consumed early in the morning, before or after working out, or as an in-between meal treat. Unlike most whey isolate formulas out there that taste like chalk or plastic, Firm Foods Whey Isolate promises a mouth-watering protein shake every single time! 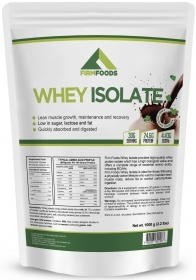 How will Firm Foods Whey Isolate support your goals? Firm Foods Whey Isolate is perfect for those who are trying to control their caloric intake, because it contains minimal amounts of fat. This protein supplement is also recommended for those who have digestive issues with lactose, as it also contains virtually zero lactose! Choose premium protein to enjoy the best muscle-building results... go for 100% Whey Isolate by Firm Foods! ALLERGEN INFORMATION: Contains milk ingredient.,May contain allergens handled in the production facilities, such as cereals containing gluten, milk, lactose, soy, nuts, sulphites, peanuts or sesame seeds. WARNINGS Whey Isolate : Do not exceed recommended dosage. Keep out of reach of children. The product should not be used in case of hypersensitivity or allergy to any of the ingredients of the formulation. Contains sweeteners. Store in a cool, dry place. BEST BEFORE: Please see lot number and expiration date stamped on the packaging.